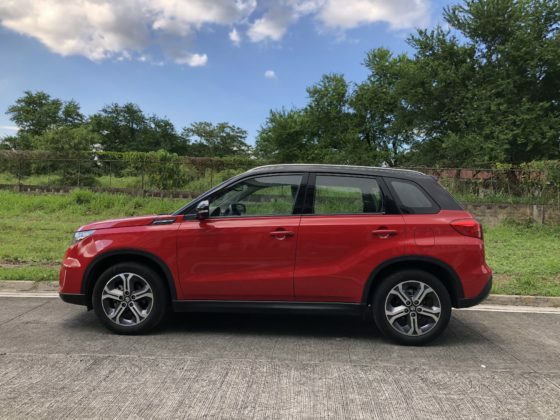 It was a wait of more than a decade, which is probably one of the longest tenures prior to a full model change, but last year’s launch of the fourth-generation Vitara was more than just highly anticipated. 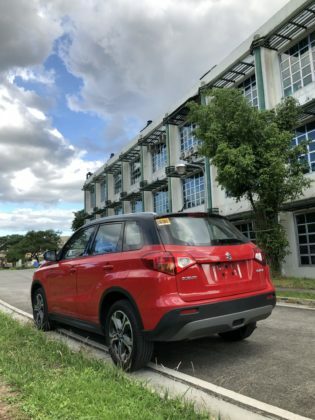 The resounding buzz around it was no surprise owing to the success of its predecessor as a sport utility vehicle in an SUV-crazy country. 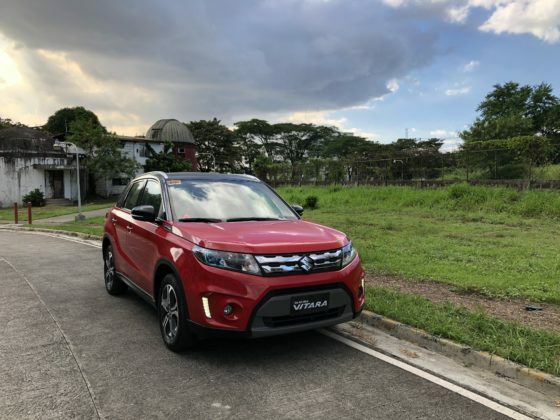 Aside from redacting the nameplate to just plain Vitara and the colorfully reshaped exterior, changes to this all-new, are more than skin-deep. 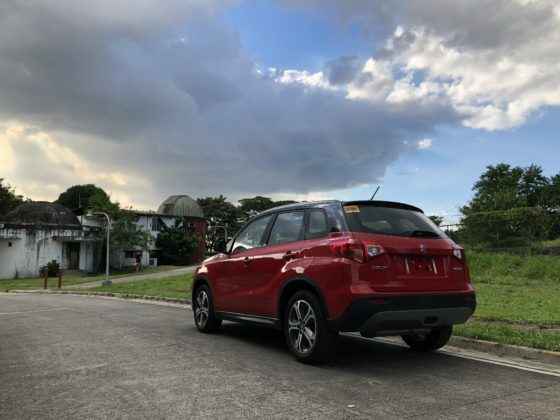 One of its biggest alterations is the shift from being a compact SUV in the last three versions of the Vitara to now being introduced as a crossover. 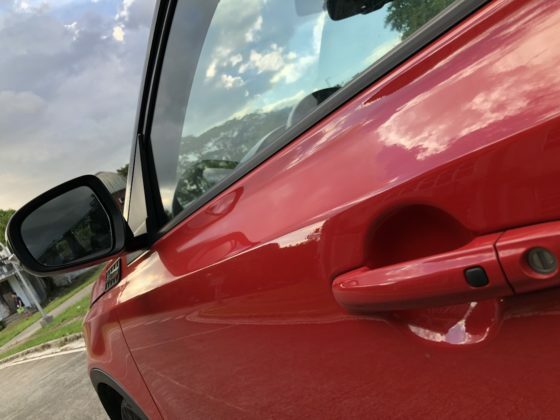 Instead of a fused body on top of a ladder-frame chassis, which is what pickup trucks and SUVs use, it now uses a unibody construction similar to how sedans and crossovers are built. It retains its overall shape but measurements show that its smaller than its predecessor in all aspects – wheelbase, length, width and even in height. What it lacks in size, it more than makes up for in styling. The shinier and more robust grille is flanked by larger LED headlamps that come with energy-saving technology and a cool-looking blue projector cover. It also sports LED daytime running lamps (DRLs) at the bottom, just right beside the fog lamps. The LEDs and DRLs are a GLX-exclusive feature. It continues to adopt the front fender garnish on both side but now sports a two-tone color scheme (body versus pillar and roof) for a fresh look and appeal to the younger market. 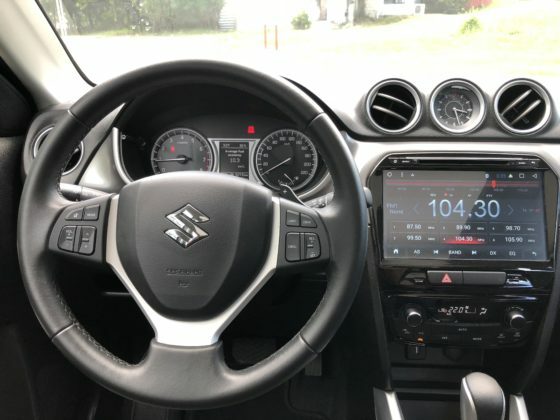 Interior plastics on the dashboards and door panels haven’t improved much from the previous generation but the generous 10-inch touchscreen is a more vibrant upgrade than the 6.1-inch of the Grand Vitara. 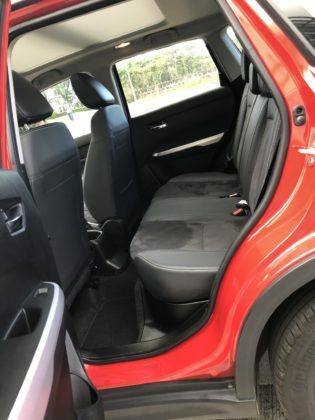 Fronts seats are four-way adjustable but all come in a fabric-leather combo, which feels like a good compromise as the flat surfaces get the fabric so it doesn’t feel like it’s about to burn your legs when the vehicle’s parked under the sun. 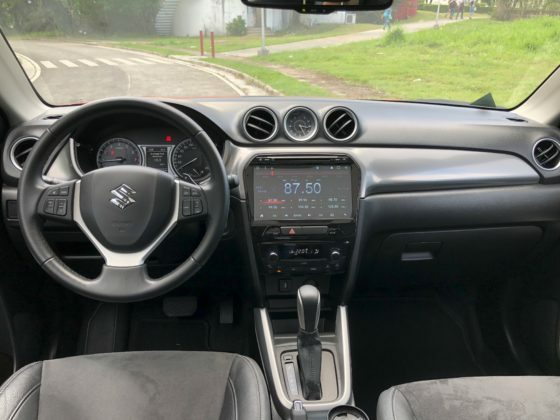 The steering wheel takes after the previous model, which actually felt large before and more so now with the smaller Vitara. It comes with added buttons of the right side for cruise control. 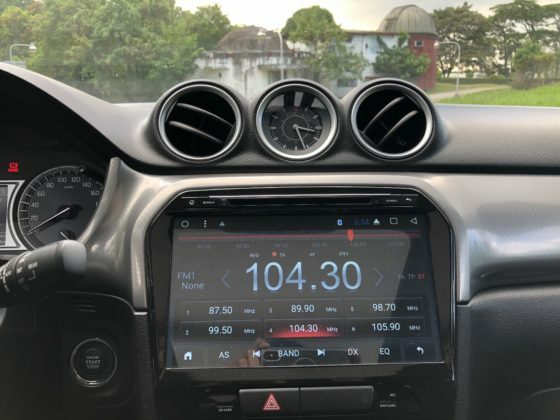 Its front panel comes with a more uniform now with the circular vents, an analog clock and the dual-gauge instrumentation panel with a multi-information display in the middle. 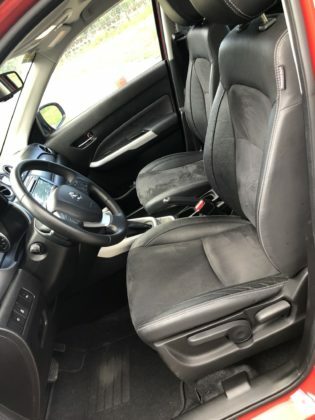 But the cabin’s best feature has to the extra-large panoramic sunroof that starts from the front and extends all the way back to the second row. 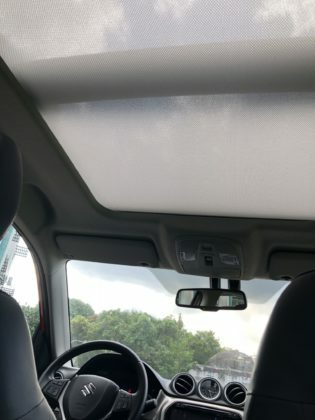 The almost-transparent ceiling cover leaves the cabin well-lit during the day which is nice but I’d wish it to be a little bit more opaque for days when you want to be less visible to onlookers. As many as the changes have been inside and outside, under the hood, it still uses same old engine, an M16A 1.6L naturally-aspirated engine with 113.4 brake horsepower and 115 ft-lb of torque. Even if it’s lighter and smaller than the previous generation, the engine seems to have only enough to make it feel mobile, but not agile. There’s a fair amount of acceleration but not as exhilarating as you’d expect from an SUV-turned-crossover unit. You’d have to put a deliberate amount of throttle pressure to really get it zooming but by that point, you’d hear it revving loudly which means you’re consuming more that your daily quota of fuel. The good thing about this engine is it’s very fuel-efficient. 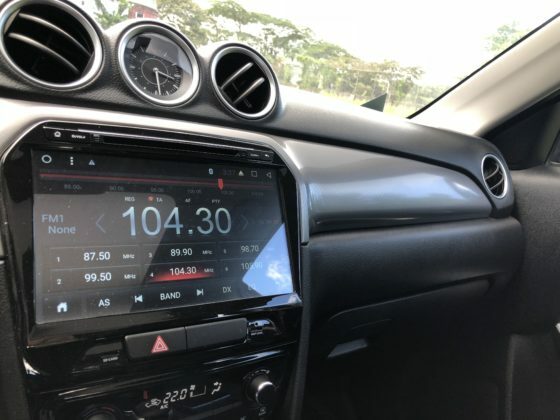 On a full seven days of pure city driving, and in mostly rush hour conditions, it returned a very wallet-friendly 10.4 kilometers per liter. So, who am I to complain? 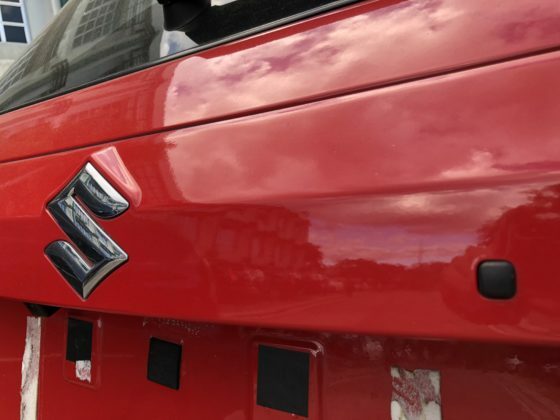 But knowing that Suzuki has a 1.6L turbo-diesel and 1.4L turbocharged gasoline engine option in other markets around the world, I’m just hopeful we get that sooner than later. Steering doesn’t feel adjusted to its new layout as feedback seems truck-like, a little heavy and mushy. The new torsion beam rear suspension setup does a good job reducing body roll around corners but somehow defeats the unibody construction’s purpose of reducing road noise, vibration and harshness (NVH). Sure, the 17-inch wheels have something to do with it, but NVH levels should be a few notches lower being that it’s a crossover. What I do like is the ease of handling. As a compact unit, it’s easy to take around and maneuver through traffic. It’s also a big plus that it now comes with a lot of new safety features including Hill Hold Control, Electronic Stability Program, parking (front and rear) and proximity sensors, and a reverse camera, which will all come in very handy during the daily commute. It has come catching up to do to be at par with today’s crossovers but it’s already made great strides. 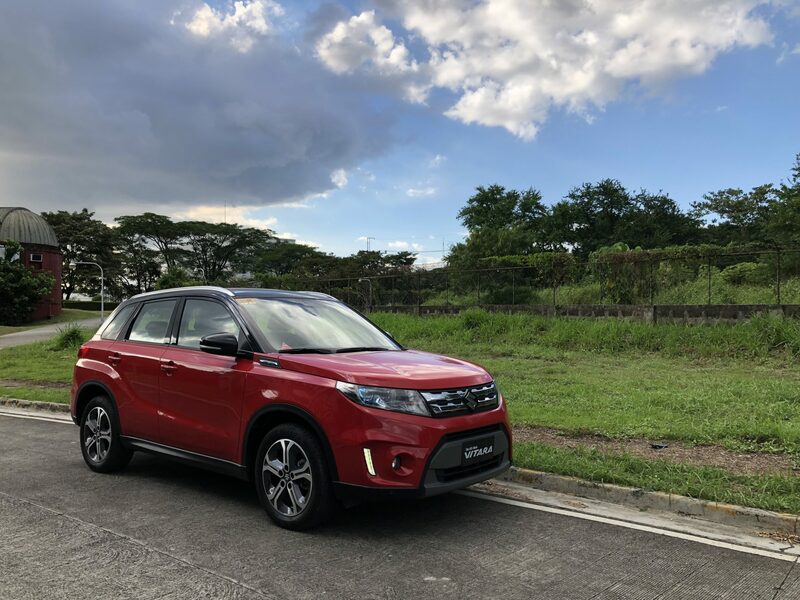 The 2018 Suzuki Vitara GLX – A/T still gets high marks with its eye-catching design, safety features and great fuel efficiency.